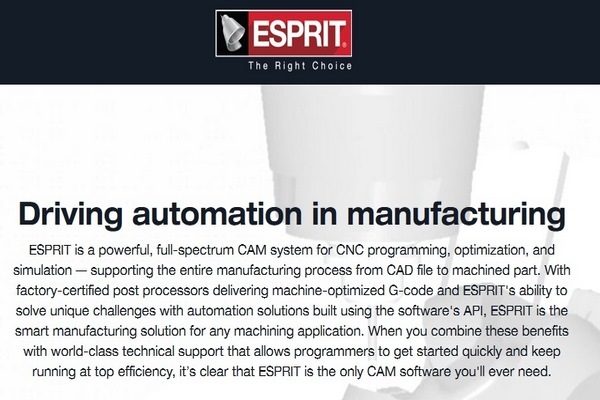 ESPRIT is a full spectrum CAM software for CNC programming, simulation and optimization that supports the entire manufacturing process, including CAD file and machining. Its post processors are factory-certified, able to solve unique industry challenges and deliver machine optimized G-code. It allows developers to quickly get started, offers comprehensive tool control and fully supports the entire machine shop. With cloud-enabled functionalities, the software is ready for the factories of the future and comes with a highly customizable API that allows users to program, stimulate and process more efficiently. The software allows importing almost any CAD file and offers post processors for virtually all machine tools. The system works well for a variety of industries, including medical, motorsports, aerospace and energy. The software eliminates NC machine dry runs by providing accurate, yet fast and reliable solid verification. This provides users with complete confidence in the machining process and ensures correct machining of even the most complex parts. ESPRIT delivers better machining processes through sophisticated steep milling, smarter facing, faster toolpath calculation times and more responsive 5-axis Swarf-machining. It simplifies machine features editing and provides a detailed recognition of multifaceted holes. It recognizes complex holes as a succession of sections that have their own properties. A feature path can be edited easily, while the surrounding elements extend automatically. Being a high-performance CAM software, ESPRIT works with virtually all CNC machines and offers a comprehensive set of tools and functionalities, including 2-5 axis milling programming, 2-5 axis wire EDM, 2-22 axis turning, mill-turn machining and multitasking. It enables industries to streamline operations using the comprehensive suite of machining cycles and tool control. The CAD to CAM interface allows importing native part models directly from the source, without requiring the programmers to rebuilt or edit the geometry. This helps reduce the programming time dramatically and ensures that the parts geometry is accurate and complete. ESPRITâs Stock Automation Engine reduces calculation times and calculates pocketing, facing and countering within seconds. The Onshape Connect app is a full-cloud CAD designed to make collaboration easier and more effective while providing CAD access to a variety of devices.